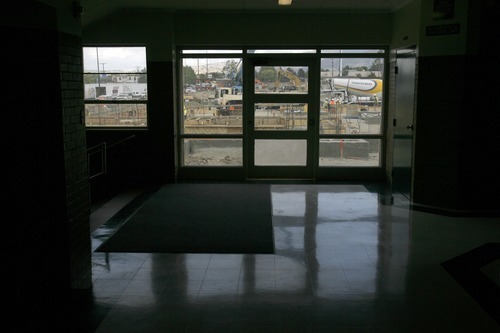 A new high school is going up as life continues in the 53-year-old original building. 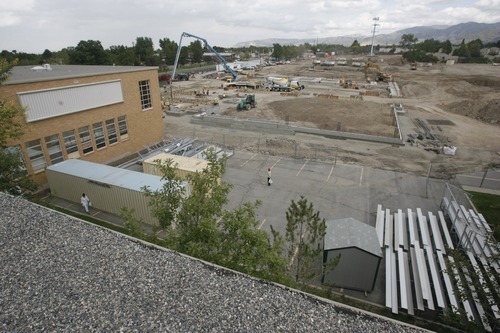 Olympus High School is being rebuilt on the same property as the existing campus, whose north end is now a giant construction zone. When complete, the campus will be slightly more than 50 percent larger than the existing one, which was built 58 years ago. The new three-story campus will open in 2013. "There is a lot going on, but it's business as usual. Every square foot [of the campus] is in use," said principal Mark Manning. "I think everyone is excited about the new school. The new campus will have the latest technology. The students will have the ability to use their laptops, iPads and netbooks in the new building." Currently, Olympus High serves a little more than 1,500 students. 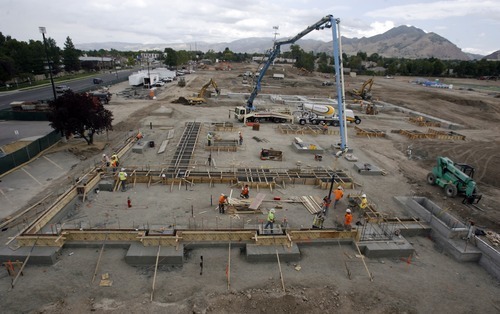 The new building will have the capacity to serve 1,700 students, but because Holladay City is an established community, there are no plans in place to accommodate a large student body. "[The new building] wasn't designed as a large campus," Manning said. 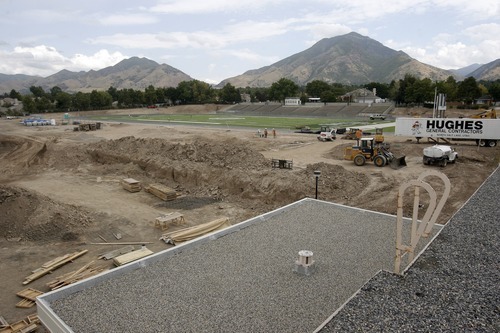 During the construction phase, the baseball field has been torn up and the north parking lot is gone. During baseball season, the team will play and practice at the old Granite High School, 3305 S. 500 East. "There is plenty of parking on the south side," said Principal Manning. "We talked with a lot of kids, we talked with a lot of teachers, and there is plenty of space for parents to pick their kids up and drop them off." New construction includes a football stadium, which will be located along East Milky Way. The field will feature turf instead of grass and markings for soccer and lacrosse. The new stadium also will feature a press box and a circular, synthetic track designed to host track meets. 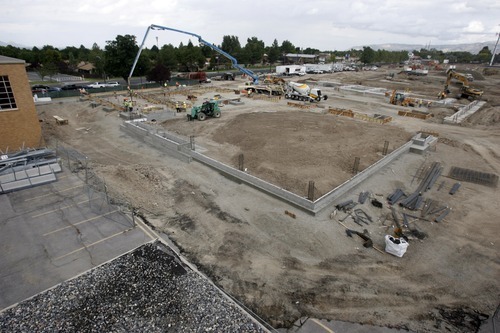 The old baseball field, on the corner of 3900 South and 2300 East, will become the site of the new building. The school's southeast corner will house the performing arts wing, including an auditorium, a black box theater (think theater-in-the-round) and choral and orchestra rooms. The middle section of the new building will house the three-story academic area. Wide hallways will include sections of lockers. There also will be a commons area with a view of Mount Olympus. "It is a state-of-the-art type facility. It will have beautiful science labs," said Manning. "And students will be able to take online courses  high school level  and courses that will help get students ready for college," he added. The administration offices also will be a part of the main building. A second phase of construction, which will include an auto shop and swimming pool, is planned for later. 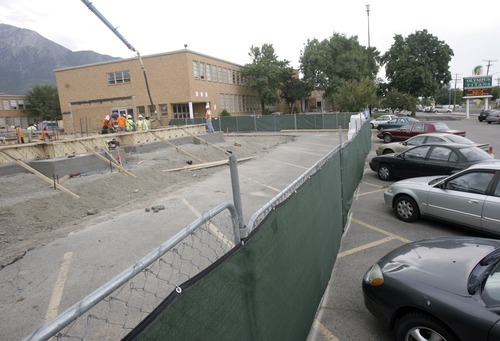 The $65 million bond project came together thanks to a rebuild committee consisting of members of the community, Olympus High faculty and Granite School District employees. 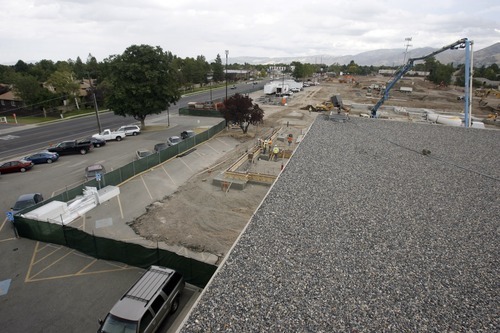 "It was a good collaborative effort," said Geoff Woods, Granite School District architect. The rebuild committee had a vote regarding every aspect of the new building's design, the placement of the new parking lots, as well as traffic flow considerations. In addition to being "state-of-the-art," the new campus will reflect the neighborhood around it with a mix of masonry, accent brickwork and glass. The new campus was designed by FFKR, the architects who designed the downtown City Creek project.